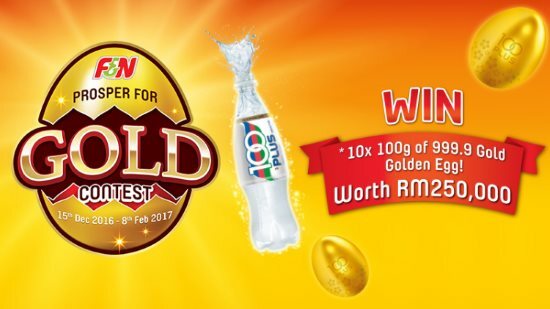 Home » Food n Beverage » gold » offline contest » purchase » spend » The F&N PROSPER FOR GOLD Contest: 10x 100g of 999.9 Gold Golden Egg worth RM250,000 waiting to be won! The F&N PROSPER FOR GOLD Contest: 10x 100g of 999.9 Gold Golden Egg worth RM250,000 waiting to be won! Buy 100PLUS Original Bottle* (500ml or 1.5L) and cut out the label. Submit the label together with a completed Contest Form. Mail it to the address stated on the Contest Form. Visit The F&N PROSPER FOR GOLD Contest page for more details.